So this is my first post on this site as well as my first delta pokemon. 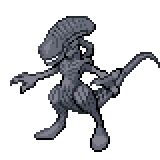 This delta mewtwo is based off of the alien from the famous sci-fi film: Alien/Alien vs Predator. Feel free to give any kind of constructive criticism!